I’m the mother of two sports-mad sons, so State of Origin is a big deal in my household. I am a relative newcomer to the sport of rugby league, but sat down with my family to watch game three on Wednesday. And was completely taken aback by what I saw. It wasn’t due to Tyson Frizell’s storming first-half try for New South Wales or Queenslander Gavin Cooper’s classy second-half effort. It was the sheer extent of alcohol advertising. I was even tempted to ask my sons if the New South Wales VB’s were playing the Queensland XXXX’s. State of Origin is Australia’s largest television event. More than four million viewers watch the game and yet the advertising and sponsorship deals are overwhelmingly led by alcohol brands, closely followed by other unhealthy products like gambling and junk food. To me, it is crystal clear that the current social and cultural environment surrounding our professional sporting codes appears to be reinforcing unhealthy drinking norms. And worse yet, it is geared directly at the most vulnerable of targets: impressionable youth who idolise the sport and its players. It appears that children’s protection from alcohol advertising becomes a total non-factor the minute they develop into sports fans. A recent study by Monash University concluded that children are engaging with thousands of advertisements for booze while they watch live sport. The same report notes that Australian children’s exposure to alcohol advertising would be, literally, halved if these ads were banned during sports broadcasts. Research has found that a quarter of all alcohol advertising was found in sporting events. In this environment, the industry codes which would ordinarily ban alcohol marketing between 6am and 8.30pm are completely abandoned – protected under an inexplicable clause that permits such a practice in sports. Yet back in 2012 when the Commonwealth Government targeted alcohol sponsorship of sports as part of its Be The Influence campaign, both the NRL and AFL outright declined to sign up. Thanks to sponsorships on team jerseys, your child’s sporting hero runs around the pitch as a human billboard for beer or spirits. With both of my boys now 21 years old, and legally old enough to drink, sports are often enjoyed with a beer in hand. In many ways it seems these alcohol companies have been successful in indoctrinating not only my children, but the younger generation of Australians, into continuing the ongoing love affair between sports and booze. 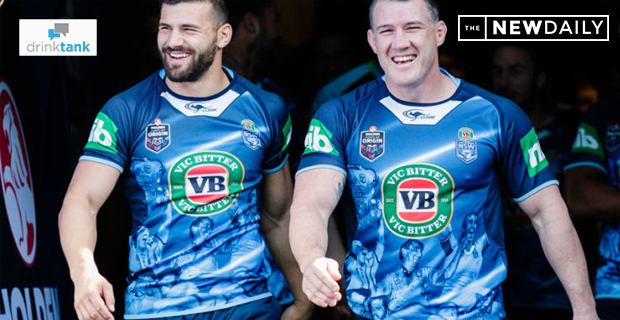 Rugby league’s relationship with booze is not limited to sponsorship. It is also the common denominator in almost all off-field incidents involving players. Nightclub brawls, horrific violence against women, ‘Mad-Mondays’ and lewd acts involving dogs are just some of the many sordid acts made infamous by drunk rugby league players over the years. Of course, this problem is not limited exclusively to the NRL – with the AFL, Cricket Australia, Rugby Union and many other sports all profiting from similar advertising contracts. Despite an increase in the demand for proper regulatory action against alcohol advertising in sports, it appears the bar can still be lowered. Just last month, the NRL, The Daily Telegraph, Carton United Breweries, Woolworths BWS and the NSW Blues team all collaborated to give away free, limited-edition commemorative blue Victoria Bitter cans, via a token in the paper. It is obvious that cans decorated with the Blues jersey have an innate attraction to youth, and with the tastefully subtle headline, “FREE BEER TODAY”, it is obvious how systemic this issue is. Former Parramatta and State of Origin player Steve Ella wrote to the NRL over a month ago with his concerns about the free beer promotion, but still hasn’t heard anything. Steve, and his daughter Kristen, have since started a Change.org petition calling on NRL CEO Todd Greenberg to phase out alcohol sponsorship. To my mind, we as parents are complicit if we don’t call the alcohol companies to account. Concerned parents can sign the petition to phase alcohol sponsorship out of the NRL today to demand a better future for our kids. Having a beer and watching the footy is as Australian as it gets. But it’s time to take a responsible approach to the promotion of alcohol, before the next generation drowns in it. This post first appeared in The New Daily.